Based in Ormeau Queensland, between Brisbane and the Gold Coast, Just MotoBike Transport was founded by husband and wife team, Karl and Fay Johnston in 2005 and provides motorbike transport around Australia. Just Motorbike Transport moves bikes Australia wide – we are fast and reliable motorbike transport specialists. Fay takes care of the day to day running of the office, including providing quotes from phone and web enquiries, to liaising and informing clients of the progress and status of their motorbike transport move. Karl helps with the day to day running of the office. 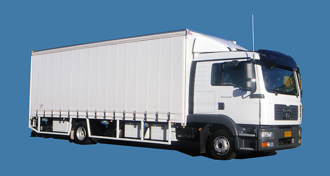 Trucks used are medium rigid, fully enclosed with soft curtains, tail gate loader for easy loading and unloading and can carry 9 bikes. The truck is fitted with E- tracks on the floor of the truck for easy tie down, bikes are tied down at 6 points 2 in the front, 2 in the middle and 2 at the back of the bike. Bikes are not tied down on the forks of the bike with ratchet straps. We transport motorbikes all over Australia, from Western Australia, South Australia to Darwin, Mackay, Townsville, Brisbane, Sydney and Melbourne. Please either use our online quote system or call our office on 0488 466 022 for your next bike move.